The heart of Dr. William A. Albrecht’s research is this. Optimum fertility results from balancing Calcium, Magnesium, Phosphorous, Potassium, Sodium, and Sulfur in proper quantities and percentages. These are the primary nutrient minerals. The secondary nutrient minerals are Boron, Copper, Iron, Manganese, and Zinc. These are secondary not in their importance but in the quantities required. They are synergists, mobilizers, and activators in the utilization of the primary minerals as well as having their own importance as nutrients. We know more today about the importance of micro (trace) minerals and their relationship to soil, plant, human, and animal health. Look on the label of any multiple vitamin product and you will see the inclusion of the micro elements Chromium, Molybdenum, Selenium, Silicon, and Vanadium among others. We know these are very important to plant, animal, and human health. However, they are needed in minute quantities. Selenium for example, is essential for immune system function. Molybdenum is a catalyst for all known Nitrogen-fixing bacteria. Without trace amounts of Molybdenum there would be no Nitrogen fixation in the soil. Natural sources of multiple trace minerals are highly recommended in addition to the primary and secondary minerals found to be deficient on the soil test. These natural sources include kelp meal, glacial rock dust, Azomite Volcanic Rock Powder (A to Z of minerals including trace elements) rock phosphate, Jersey Green Sand, and Redmond mineral salt. These sources contain from 30 to over 60 micro minerals. The type of soil you have and its history determines whether or not you would benefit from the addition of a micro mineral source. Learn more about the function of these minerals. The exchange capacity of a soil is the measure of its ability to hold on to, and release mineral nutrients. The soil must hold on to the nutrients so they don’t leach away, and release the nutrients so they can be taken up by the plant roots. 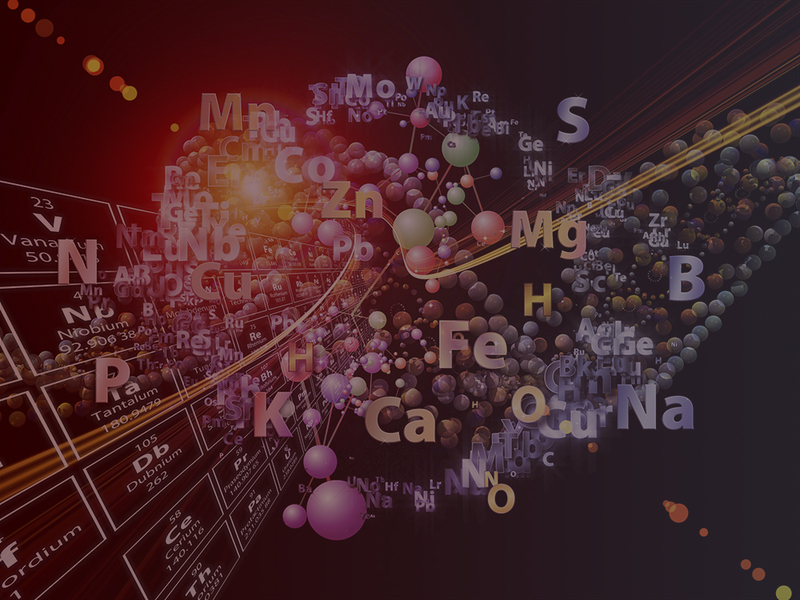 Calcium, Magnesium, Potassium, and Sodium are the primary cations. They are alkaline nutrients or bases. A cation (pronounced cat-eye-on) is a positively charged particle or ion. Humus (soil organic matter that has been broken down as far as it can and still be organic matter) and clay have negatively charged exchange sites that attract and hold on to positively charged nutrients by an electrostatic bond, (opposite charges attract) preventing them from being leached away. Hydrogen is also a cation that is exuded by plant roots, and beneficial microorganisms as they break down organic matter. When the concentration of Hydrogen ions is high enough in the soil solution that some of them surround the nutrient cation and get closer to the negatively charged exchange sites than the nutrient cation is, the hydrogen ions will fill the exchange site, neutralize the negative charge, and the nutrient cation will be free of its electrostatic bond and can be taken up by plant roots and microorganisms. Dr. Albrecht determined an optimum level of the base cations Calcium, Magnesium, Potassium, and Sodium that maximized soil fertility. He found that the exchange sites, when saturated with 65% Calcium, 15% Magnesium, 4% Potassium, and 1 to 5% Sodium, resulted in maximum plant nutrient density, vigor, yield, and pest and disease resistance. These base cation percentages are the foundation upon which everything else is constructed when writing a custom soil prescription. Soil organic matter has both negative and positive exchange sites. Optimum levels of the primary anions (negatively charged ions) Phosphorous and Sulfur must also be present. Without adequate Sulfur, much of the ammonia Nitrogen generated by the breakdown of organic matter will be off-gassed into the atmosphere and be lost. Much of the Carbon will be lost as well as it is off-gassed as Carbon dioxide. (CO2). Maintaining an optimum level of Sulfur will keep much of the Nitrogen and Carbon in the soil where the Carbon will be incorporated into stable humus. Next, the secondary elements of Boron, Copper, Iron, Manganese, and Zinc must be present in optimum quantities. Finally, trace elements must be present in small amounts (a few parts per million in many cases). This includes Silicon, Chromium, Cobalt, Fluorine, Iodine, Molybdenum, Nickel, Selenium, Tin, and Vanadium. It has been estimated that over 30 other elements are needed in a healthy soil. The best sources for these are ancient seabed or volcanic deposits, greensand, rock phosphate, and seaweed. Each mineral has a myriad of functions in the soil and in the plant. Optimum quantities of each, ensure they work together to result in healthy and nutritious crops. Justus Von Liebig, considered the founder of organic chemistry and regarded as one of the greatest chemistry scientists of all time, made major contributions to biological and agricultural chemistry. He popularized the “law of the minimum” which states the availability of the most abundant nutrient in the soil is only as good as the availability of the least abundant nutrient in the soil. To put it another way, a plant’s growth is limited by the nutrient in shortest supply. Although these minerals are critical to the health and vitality of plants—animals and humans require all of them as well. For further education on the importance of these elements to human nutrition, we would highly recommend reading “Nourishing Traditions” by Sally Fallon with Mary G. Enig, Ph.D. It is a nutritional eye-opener complete with recipes and might positively change the way you look at food and its preparation. Click through the list below for a brief look at a few of the functions of each mineral. Trace minerals, or Micro Elements as they are often referred to, are essential for soil, plant, animal, and human health. We know more about this subject today then ever before. These micro elements are needed only in very small quantities; a few parts per million in many cases. Good examples of the importance of trace elements are illustrated by Molybdenum, a catalyst necessary for Nitrogen fixing bacteria in the soil. Also, Selenium is essential for proper immune system function, is associated with resistance to viruses, and is a co-factor with vitamin E. Cobalt is essential for ruminants such as sheep and cattle. They produce vitamin B-12 in their digestive system when Cobalt is present in their forage. When Cobalt is absent, these animals may be subject to numerous diseases and infections. Silicon strengthens cell walls making the plant less susceptible to insects and diseases. It also increases stem strength helping to prevent losses due to lodging. The soil test we recommend includes Cobalt, Molybdenum, Selenium, and Silicon. There are several ways to ensure that your soil has adequate amounts of trace elements. *Not presently approved for certified organic use but proven safe and effective. Where organic certification is necessary, organic approved amendments will be used. For more information contact us or refer to the Recommended Reading list.